Classic VW owners spend a lot of time taking care of the exterior of their vehicles, but the interior is just as important, because lets face it, that is where you spend most of your time while using your VDub. 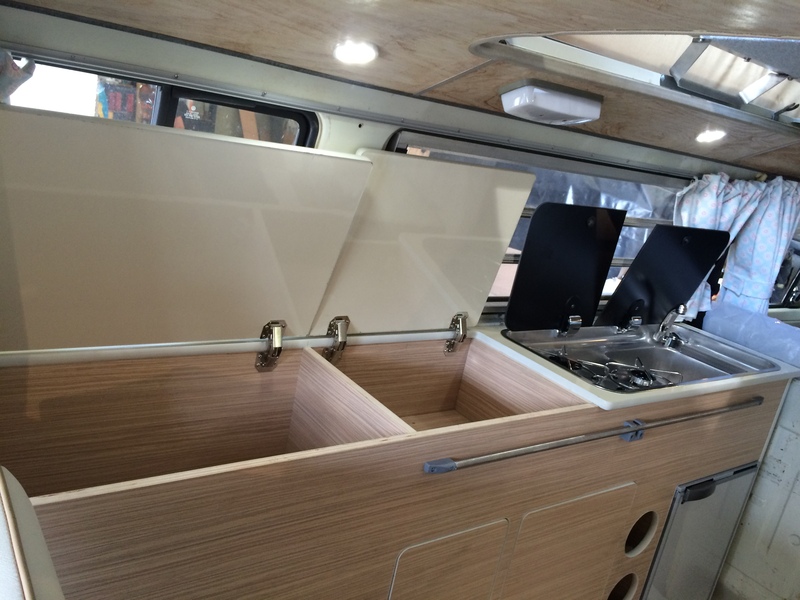 We can build your camper van a new interior entirely how you want it. For all models of VW Camper from the Splitscreen camper, to the Bay Window and up to the T25. We are constantly developing our range and making sure that the materials and equipment we use are the best. All of our interior unit systems and build from lightweight plywood, which is something you will often see in more modern camper vans, but we find the range of finishes this material is available in is vast, the wood is hard wearing and above all it is lighter than most of materials used in the construction of a camper van interior, which for a slow old VW is a major factor. 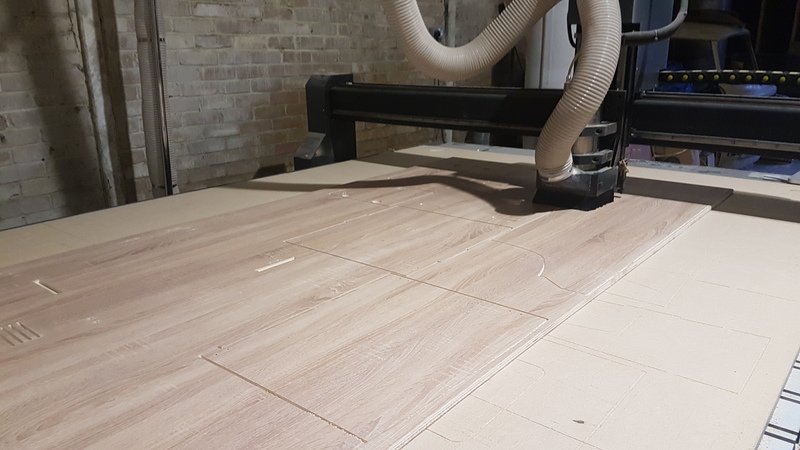 This lightweight wood is turned from sheet material into and interior using our own in house CNC machine, that provides above all accuracy so you know the fit and finish of the units will be the best. Our range of what we term "standard" interiors is shown below, but this is by no means exhaustive. We are happy to work with you and design a bespoke package or even make changes to one of the standard range so that it works for you. The standard range of units are even available as a flat pack system for the DIY capable enthusiast to assemble at home. 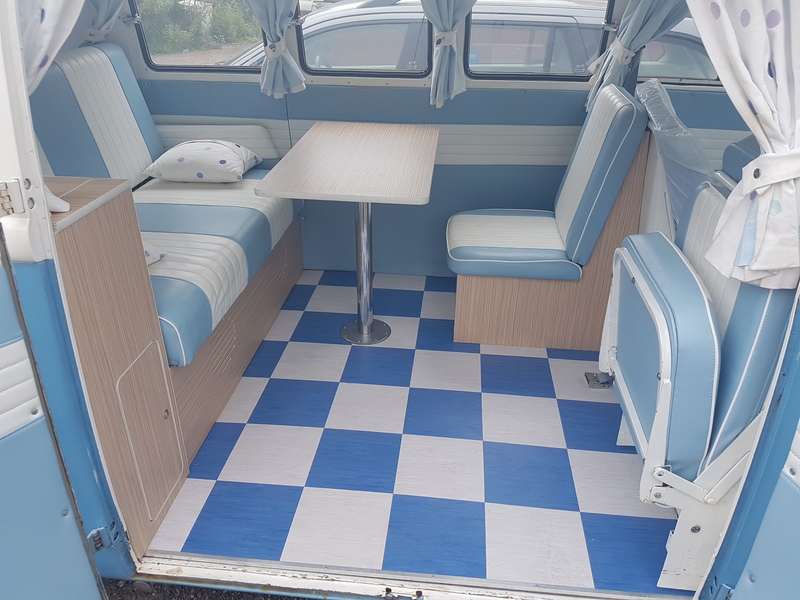 This day van conversion facilitates a Rusty Lee 3/4 width rock and roll bed, Sussex Aircooled Units with, side storage and wardrobe, overhead locker and two buddy seats and a table. This gives the feeling of a much larger open space within the van for general use, along with 4 seat positions and a twin bed for night time. Finished in either single or two tone upholstery with your choice of colours and flooring. From £3,550 +vat inc installation. £1,995 +vat supply of flat pack units and R&R bed frame. This classic style conversion is suitable for LHD and RHD vans, with or without pop-top roofs. It features a full length unit along the drivers side with wardrobe section at the rear. Plenty of cupboard space, bottle store, lift up work surface to access more storage space, removable table 3/4 width Rusty Lee R&R bed. Gas hob & sink unit made by CAN and 12v compressor fridge from Vitrifrigo. From £TBC +vat inc installation. £TBC +vat supply of flat pack units and R&R bed frame.